Google 'PHLOAAHHSSPLATTT', AKA the sound of vomit hitting cement, and this is what will come up. It's actually the Tesla Model S of Google co-founder Sergey Brin, and as you can see, it's sporting some unique...modifications. 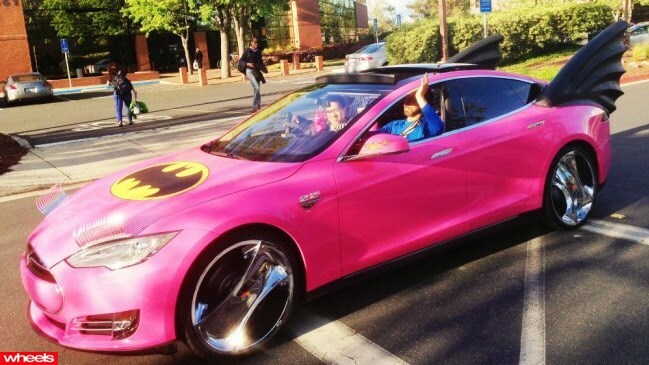 The mods, which include a pink vinyl wrap, Batman logo and fins, headlight eyelashes and chrome wheels – complete with Google Chrome logo – are understood to have been part of an April Fool's joke. Photos of Brin driving the car have emerged online, but all we can do is hope he's since returned it back to its stock form.